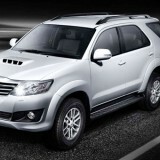 Planning to Hire a Luxury Fortuner for Hire, It's muscular hulk, “The Toyota Fortuner Rentals” with its outstanding performance, luxury car rentals, comfort, and safety makes your ride a remarkable one. The art of design and power created by Toyota, makes it look bold. Toyota Fortuner SUV Hire is based on its manufacturer’s all new platform that is being claimed to be more robust than the earlier version. The latest platform boasts a technology that not only improves the safety but also enhances the ride and handling. The rent a Fortuner really give a best experience while traveling, fortuner's aggressive with sharply styled grille and really sleek head lamps. The dual projector head lamps and LED pilot lamps and DRLs give it a premium look too. The front bumper too is very muscular and gets bits like a large air dam The front also gets several chrome bits and a prominent hood.